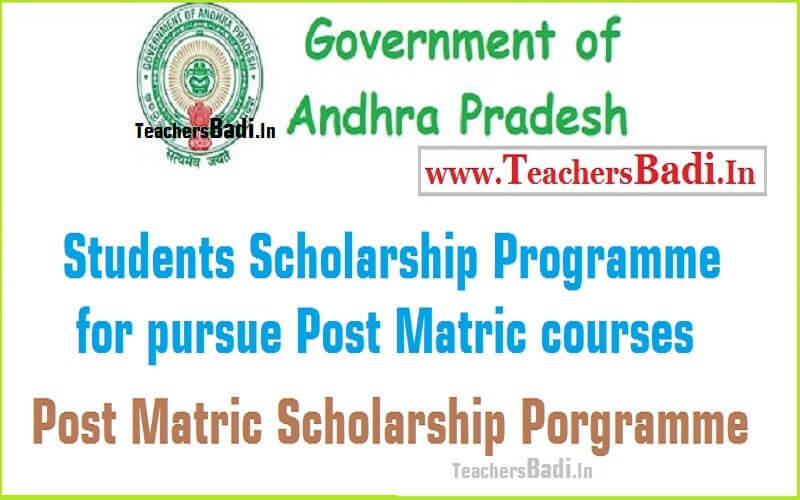 AP Students Scholarship Programme 2017-2018/Post Matric Scholarship Porgramme for Kapu Community to to pursue education at various levels, AP Students Scholarship Programme 2017-2018 for pursue Post Matric courses: Andhra Pradesh State Kapu Welfare and Development Corporation Limited (APSKWDCL), a Government of Andhra Pradesh undertaking is introducing the “Students Scholarship Programme (2017-18)” for the economically weak Kapu students in Andhra Pradesh. Under this scheme, a financial assistance shall be granted to the students on saturation basis. This assistance shall be given for living expenses, purchase of books, educational materials, other incidental expenses, etc. Objective: The scheme targets to encourage economically weak Kapu students to pursue education at various levels. Scope: This scheme is applicable to students from economically weak families of Kapu Community of Andhra Pradesh, who are studying various levels of course in the state in the Academic Year 2017-18. 1. The student and his/her parents should belong to Kapu community i.e. the Kapu, Balija, Telaga and Ontari sub-castes. 2. The student should belong to a family with income of Rs 100,000 (Rupees One Lakh Only) and below. a. The student must be studying inside Andhra Pradesh. b. Students in Post Matric Courses approved by the concerned University/Board having duration of 1 year and above are eligible for this scholarship. 4. Scholarships are not awarded for training courses like Aircraft Maintenance Engineer's Courses, Private Pilot license Courses, Courses at Pre-examination Training Centres of all India and State levels. 1. All Post Matric Colleges in Andhra Pradesh recognized by Government of Andhra Pradesh/Competent Authority. 2. Students should have an attendance of at least 75% at the end of each month. 3. The student should not have availed himself/herself any amount under any other Government scheme for the same purpose for the same academic year. 1. The notification would be released and circulated to all post matric colleges in the state in June 2016 to inform thw students from the community about the scheme. 2. Eligible candidates should fill their application online at the APSKWCL website in the prescribed format. 3. Candidates should provide their email id and mobile number of their parents/guardians during registering for the scheme. a. Income Certificate for the student’s family. b. Aadhar Cards of the student and both parents/ parent (in case of single parent)/ guardian (in case of orphan). d. Passbook details of Savings Bank Account in any Nationalized Bank (account must be in the name of applicant). e. Passport size photograph (in JPEG format upto 50 KB size). d. Study certificate from the College/Institution of study for Academic year 2016-17. 1. Students shall apply online within one month from the date of admission. 2. The Principal should issue Bona fide certificate which shall be scanned and uploaded by the student along with the application. 3. Scrutinising of applicants shall be done based on the online application data. 4. A list of scrutinised candidates shall be shared with the respective college. 5. A poorest of poor volunteer shall be selected by the college to upload the monthly attendance statements, attested by the department, to the corporation website. He/she shall be remunerated an amount of Rs 2,000 (Rupees Two Thousand Only) for the academic year for uploading of the monthly attendance statements throughout the year. 6. Any student not achieving a minimum of 75% attendance for consecutive 3 months shall be delisted from the scheme. 7. The grant for the student shall be credited evenly spread over the period of 10 months in monthly basis. 8. The State Level Committee is authorised to make exceptions in the eligibility/selection process and their decision shall be final. 9. Any false information in the application, if identified, shall be shared with the college and disciplinary action would be taken against the student. For any clarifications or difficulties in applying for the program, applicants can contact Executive Director/ Project Director of BC Corporation/Kapu Corporation or the APSKWDCL helpline.